The Cleanwaste Go Anywhere Outdoor Portable Toilet Review! Be sure to check out two video reviews on this cleanwaste go anywhere portable toilet system below! Just UPDATED! Do you want the ability to have a portable toilet that you can take with you on virtually any adventure? 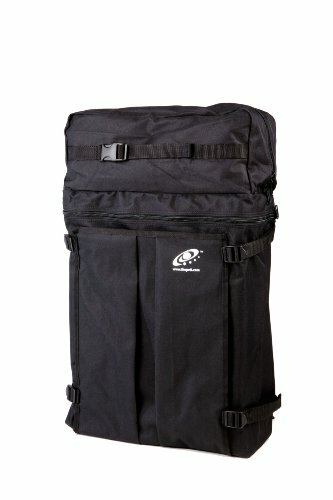 Are you looking for something that will give you a measure of privacy, even if you’re out in the backwoods somewhere? The Cleanwaste Go Anywhere Portable Toilet System will give you all of that for an incredibly affordable price! 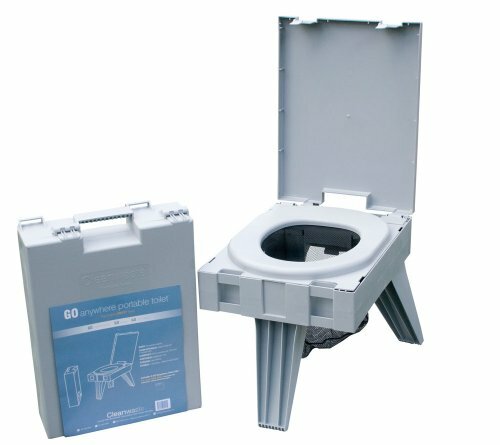 UPDATE: This CleanWaste Go Anywhere Portable Toilet On Sale At Time Of Update May 19, 2017 for Just $185! Free Shipping Too! For less than $280 on Amazon, you’ll get a complete system that includes a privacy shelter, a backpack for storage, a portable toilet and the waste bags that you need to pack your waste out. What Features Do You Get With This Toilet System? The Cleanwaste portable system is all about rugged durability. Although this isn’t going to be the bastion of luxury when you’re out in the woods, this is the system that US Marines use because it offers a measure of privacy so that you can maintain a level of dignity while out in the field. We also really loved how light this entire system is: just 18 pounds! That means you’ll be getting a very compact system that is easy to setup and easy to take down when it is time to go. with the 15 waste bags included, there really is no mess and the system makes it possible to literally go anywhere, have a toilet, and be able to pack out your waste. Sanitary toilets outside are always desireable! There are some things that are best to never be without. Portable Toilets are always a great idea! In the world of camping, living off the grid as much as possible, or just having some extra portable convenience, the Cleanwaste Go Anywhere system qualifies as one of those items you won’t want to be without once you experience it for yourself. Do You Get Any Advantages With The Cleanwaste Go Anywhere Complete Portable Toilet System? There are a few portable toilet systems that are out on the market today, but they have one problem: zero space. You set up the privacy screen, but then your shoulders are basically touching the edges of the tent when you sit down. 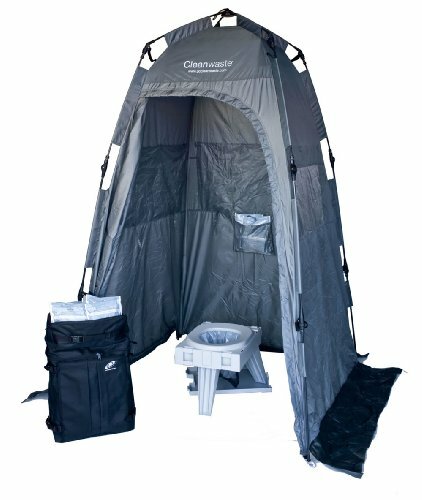 With this Cleanwaste Go Protable Toilet system, you’ve got enough room for most people to stand up, have some space to walk around to take care of their business, and do so while still within the area of privacy that the tent provides. There really isn’t something bad to say about this particular portable toileting system. The Cleanwate Go Anywhere Total Toilet System is Ready for Your Outdoor Adventures! It gives you all of the tools that you’re going to need! When you’re out on an adventure and need to go, you won’t have to find a tree or wait for the next rest area. You can just put up the Cleanwaste Go Anywhere system and be done with it! Click here to compare prices on Amazon and get the best price on the Cleanwaste Go Anywhere Portable Toilet System. Here is a gentleman who loves his outdoor toilet. His name is Hugh Simpson. Hugh is a former investigative reporter for CBS news – now a serial entreprenuer. He contributed this great How To Use the Cleanwate Go Toilet System. Great job, Hugh.